PEAK 10 SKIN’s BLACK DIAMOND intense repair cream uses Cotton Thistle Extract to repair damaged skin and speed up the natural reparation process, while delivering incredible hydration with two rehydrating oils from the fruit of the palm tree. It is comfortably absorb into your skin while your body goes to work, re-growing and repairing. It stimulates our bodies natural healing in much the same way that fertilizer stimulates a plant to grow. 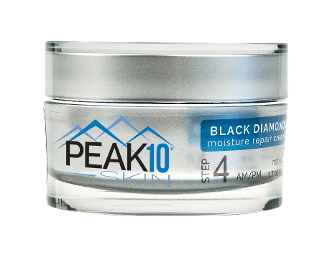 PEAK 10 SKIN’s BLACK DIAMOND moisture repair cream can be used day or night especially in harsh elements or extreme dry climates. This invigorating product will repair dry, flaky and damaged skin, restoring your silky smooth healthy glow. Remove all make up and clean skin. Apply to face before sleep. May be used day or night. Purified Water (Aqua), Simmondsia Chinensis (Jojoba) Seed Oil, Squalane, Hyaluronic Acid, Candelilla/ Jojoba/Rice Bran Polyglyceryl-3 Esters, Glyceryl Stearate, Cetearyl Alcohol, Sodium Stearoyl Lactylate, Glycerin, Cetyl Alcohol, Hydrogenated Palm Kernel Glycerides, Hydrogenated Palm Glycerides, Hydroxypropyl Starch, Phenoxyethanol, Ethylhexylglycerin, Xanthan Gum.